Kathmandu University, School of Engineering, in cooperation with Norwegian University of Science and Technology, NTNU, invites application for admission in the Master Program in Planning and Operation of Energy Systems (MPPOES). There are altogether 10 seats (5+5) allocated for national and the international students from selected countries. The enrolled students will be nominated for Scholarship.The MPPOES is fully financed under NORAD’s Master Program within the Energy and Petroleum (EnPe) sector for Master and PhD Studies and is administered by Norwegian University of Science and Technology (NTNU), Norway. The application deadline is 10th December 2011. Application clearly marked as EnPe Fellowship shall be sent directly to Kathmandu University, School of Engineering, P.O.Box.6250, Kathmandu,Nepal. Please note that the priority will be given to the qualified female candidates. More details on the Call for Applications and other Procedures to be followed would be posted on the University’s website. This is hereby notified that the following graduate applicants for Graduate Admission 2011 have been selected for admission in the following programs. Selected applicants are required to follow the following procedures. 1. Fill up the admission and registration forms. 2. Pay the required fee (NRs 70,000) to Kathmandu University’s Account at any branch of the following bank. 3. Attach the bank voucher to the completed admission form and submit the forms to the Department. The first general assembly of the University Sports Association Nepal (USAN) elected Kathmandu University teachers Dr. Kanhaiya Jha as Vice-President and Dr. Dhruba Prasad Gauchan as member in its executive committee at Kathmandu on September 16, 2011(Bhadra 30, 2068). The general assembly of USAN was inaugurated by Nepal Sports Council member Mr. Dev Kumar Lama. The sports development chief of Nepal Sports Council Mr. Prakash Chandra Ghimire was the election officer and all elected members took oath and certificates from Mr. Ghimire. The USAN is the associate member of Nepal Sports Council (NSC), Nepal Olympic Committee (NOC), Ministry of Youth & Sports; Ministry of Education; Asian University Sports Federation (AUSF)/ International Federation of University Sports (FISU). The USAN was established in 2007 but it was approved by Nepal Sports Council in 2010. The main objective of the USAN is to establish and maintain a sports organization for promoting sports among member-universities. Also, the USAN is working to provide a global platform for university students through sports activities. It is hereby notified that the following applicants for 2011 undergraduate admission in B.Sc. Computer Science at Kathmandu University have been Click selected candidates for admission. Selected applicants are required to follow the following procedures by September 25, 2011 before 3:30 pm. 2. Attach a Photo (PP) and copies of the certificates and transcripts to each form. 3. Pay the required fee (NRs. 95,000) to Kathmandu University’s Account at any branch of the following bank. 4. Attach the bank voucher to the completed admission form and submit the forms to the admission office. In the event that erroneous information or invalid documents have been provided by the applicant, intentionally or otherwise, the applicant will be automatically rejected. The School of Engineering and School of Science are pleased to announce a resumption of B.Sc. in Computer Science program from this academic year. 3. Attach a copy of high school transcript Prospective candidates are required to follow the above procedure by 4:00 PM, 20th September 2011. Note: The classes run in morning session. For detail information please contact the Department of Computer Science and Engineering. This is to inform you all that those who are willing to get admission in corporate category for MPharm (Industrial Pharmacy) and PharmD (Post Baccalaureate) should submit an application with the letter from institution/organization/industries by 2:00 pm on Sunday, 18 September 2011. Application after the deadline will not be considered. 4. Attach a copy of high school transcript Prospective candidates are required to follow the above procedure by 18th of September, 2011 before 4 pm. It is notified that following candidates have been selected for admission in various undergraduate programs of School of Science and School of Engineering at Kathmandu University under reserved seats. Selected candidates are hereby requested to proceed for admission by September 15, 2011 before 3 pm. 1. 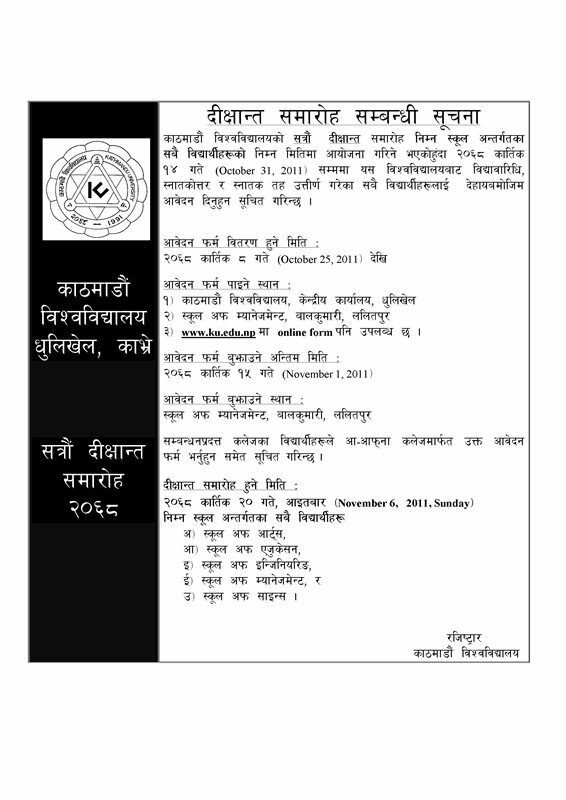 Fill up the admission and registration forms (the forms can be obtained from respective Deans Office (Block 03, School of Engineering Dean office for all engineering students except Environmental Engineering AND Block 06,School of Science Dean Office for Biotec, ENVS, ENE, Pharmacy, HB students) KU, Dhulikhel). 2. Bring two Photos (PP) and submit copies of the certificates and transcripts (Original Migration). 3. Appear for interview and verification of the certificates and transcripts. 4. Pay the required fee to Kathmandu University’s Account at any branch of the following bank. 5. Attach the bank voucher to the completed admission form and submit the forms to the respective Dean’s office. 6. Amount to be paid on admission: contact respective dean’s office or see KU home page or check catalogue provided to you at the time of application. In the event that the applicant has provided erroneous information or invalid documents, intentionally or otherwise, the applicant will be automatically rejected. Candidates who fail to submit the completed forms by September 15, 2011 before 3 pm. will not be considered for the admission. Selected applicants are hereby requested to proceed for admission by September 12, 2011 before 3 pm. Fill up the admission and registration forms (the forms can be obtained from respective Deans Office ( Block 03, School of Engineering Dean office for all engineering students except Environmental Engineering AND Block 06, School of Science Dean Office for Biotec, ENVS, ENE, Pharmacy, HB students) KU, Dhulikhel). 5. Attach the bank voucher to the completed admission form and submit the forms to the admission office. 6. Amount to be paid on admission. Candidates who fail to submit the completed forms by September 12, 2011 before 3 pm. will not be considered for the admission. 5. Attach a copy of high school transcript Prospective candidates are required to follow the above procedure by September 8th, 2011 before 4 pm.